Have you seen my Holiday Gift Guide yet? 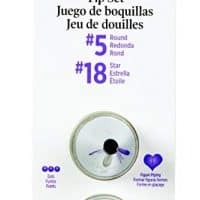 I have all my favorite things in a list for you to add to your wish list. *Be sure to sign up for the BruCrew email to receive these delicious recipes in your inbox each day. this cake is about to knock your socks off. Like completely! Are you ready for lots of peppermint goodness now that it is December? So most of the time I have a reason for making a dessert. There is usually some sort of meeting or class or life group that needs a delicious treat. Ok, ok, they might not “need” it, but I sure love making and sending sweets for them anyway. But on Saturday I got the brilliant idea to make this cake because it has been way too long since I made a big layer cake. The last one was this Lemon Cheesecake Cake two years. Two years??? I have made bundt cakes, icebox cakes, and eclair cakes, but layer cakes have been missing in action. It was definitely time for some cake fun to happen in my kitchen. After I decided how I wanted it to be, I couldn’t get it out of my head. So with no plan to get rid of this delicious monster of a cake, I went ahead and made it anyway. I figured it wouldn’t be hard to find someone to help me out with devouring it. Time for another confession…I had most of the ingredients to make this cake already in my kitchen. We had to run some errands, so I was able to pick up the 2 ingredients missing from my recipe. Do not let this holiday cake scare you from attempting it! It was actually so easy to do. The hardest part is waiting for all the layers to bake. It does take some time in baking and cooling, so make sure you have enough time set aside for that. This one does take the longest to bake and cool, so it would be a good idea to make that the day before. Make sure to get the cream cheese out early and let it come to room temperature. If it is still cool, warm it up a few seconds in the microwave, removing the foil first of course. Do not over beat your cheesecake mixture. Too much air is not a good thing for baking a cheesecake…I hear it can cause cracks! Now for the baking…some people swear by water baths. I am not one of them!!! I do add water to my oven, but the cheesecake does NOT go in it. Place a large baking sheet on the rack under the one you will be baking the cheesecake on. Fill it with hot water and turn the oven on. 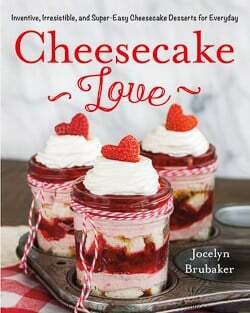 Let it heat up while you are getting the cheesecake batter ready. After the cheesecake is finished baking, remove it right away. No need to let it sit in the hot oven over baking. After 5 minute, run a knife around the outside edges of the cheesecake to loosen it from the pan, but do not remove the sides of the pan. Let it continue cooling on the wire rack for another hour. Chill the chocolate cheesecake in the refrigerator for 4-6 hours. Do not stress out if it does crack even after all the precautions. It is going inside the cake, so no one will ever know! True story! Now for the cake layers. Mix up the batter and divide it into 2 equal parts. Bake each portion in an 8-inch round pan. Let them cool in the pans for about 15 minutes and then flip out to cool on a wire rack. You can mix up the frosting while these are cooling. Do not eat a spoonful of frosting when it is done because then you will want to keep eating spoonfuls and you will not have enough to decorate the cake with. There is just enough frosting, so keep the spoons out of it, unless you plan on making a double batch. In that case, have at it! Just be sure to set 1/3 cup of frosting aside for decorating the top! Now for the fun part…cake assembly! Place cake layer 1 on a plate and top it with the cheesecake layer and then cake layer 2. Spread a thin layer of frosting on the top. Use the rest to frost the sides. Use the side of a knife to tap the frosting gently to give it the fluffy look. Make a small batch of chocolate ganache for the top, but let it cool for 10 minute before spooning on top. Why? Because hot, melted chocolate and soft sugar frosting do not mix well, and you would have a cake flop on your hands. While it is cooling, use a spoon to gently sprinkle the sides of the cake with candy cane chunks! Spread out the ganache, sprinkle with crushed candy canes, and chill for 10 minutes in the refrigerator. Then swirl on the last of the frosting (if you haven’t eaten it all already) and top it with the Candy Cane Kisses. Now slice a large piece and reward yourself for all your hard work! You deserve it! 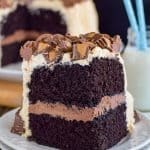 Chocolate cake and chocolate cheesecake come together in one amazing cake. 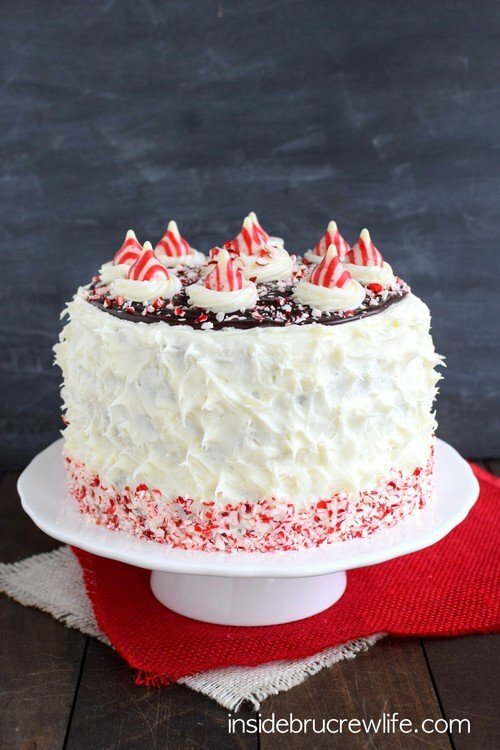 Adding a peppermint marshmallow frosting and candy cane pieces makes it the perfect holiday cake for any party. Preheat the oven to 350 degrees. Place a large sheet pan on the bottom rack and fill halfway with water. 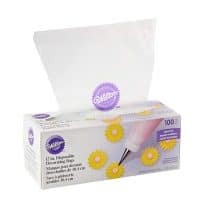 Line the bottom of an 8-inch springform pan with parchment paper. Beat the cream cheese, sour cream, and sugar until creamy. Add the eggs, vanilla, and flour and beat again. Melt the baking chocolate according to the package directions and slowly add to the cream cheese mixture while the mixer is going. Pour the cheesecake batter in the pan. Bake the cheesecake for 50 minutes. Do not over bake. Remove the cheesecake from the oven and place on a wire rack. After 5 minutes run a knife around the edge of the cheesecake to loosen the cheesecake from the pan. Do not remove the sides of the pan. Cool on a wire rack for 1-2 hours. Leave in the pan and refrigerate 4-6 hours or overnight. Preheat oven to 350 degrees. 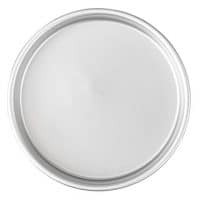 Grease and flour 2 - 8 inch cake pans. Combine the cake ingredients and beat on low for 1 minute and medium for 2 minutes. Pour the batter into the prepared pans and bake for 25-27 minutes or until a toothpick comes out with only a few crumbs sticking to it. Cool in the pan for 15 minutes before flipping out on a wire rack to cool completely. Beat the butter, marshmallow cream, vanilla, peppermint, and salt in a mixing bowl. Slowly add the powdered sugar and whipping cream and beat for 1-2 minutes until light and fluffy. Set aside 1/3 cup frosting for the garnish. Place one cake layer on a plate. Top with the cheesecake layer. Add the last cake layer on top of the cheesecake. Spread a thin layer of frosting on the top. 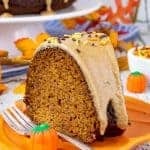 Use the rest of the frosting on the sides of the cake. Use the side of the spatula to pull out the frosting to look fluffy. Use a teaspoon to sprinkle crushed candy cane pieces on the very bottom of the cake and press in with your hands. Bring the heavy cream to just below a boil. Remove from the heat and stir in the chocolate chips until melted and creamy. Cool for 10 minutes. Spoon onto the top of the cake and spread out keeping it from going over the edges. Sprinkle with crushed candy cane pieces. Refrigerate until set. Swirl the remaining frosting on the top of the cake with a piping bag and icing tip 18. Garnish with the Candy Cane Kisses. Keep the cake covered and refrigerated. Insane, Jocelyn! Boy, am I in love here. Your baking hoarding habits are making everyone very happy this morning! This looks so rich and amazing! I am dying for a piece right now. I don’t even know where to begin on how much I love every dang part of this incredible creation! Hehe, thanks Tori! It was really really good! WHOA WHOA WHOA. 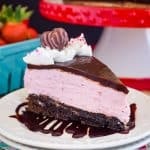 Cake, cheesecake and peppermint goodness? IN ONE? 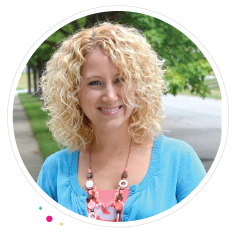 you’re right…my socks got knocked off! However, it’s snowing and I’m cold. So I had to put them back on. Or I could use this cake to keep me warm. Pinned! Haha! I say use this cake to keep you warm!! 😉 Thanks for pinning Taylor! 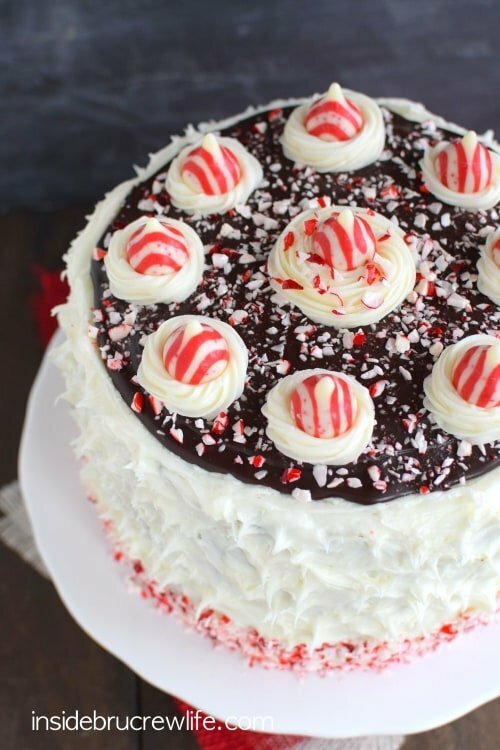 Love the peppermint and chocolate combo! This cake is gorgeous! Pinned to make later! 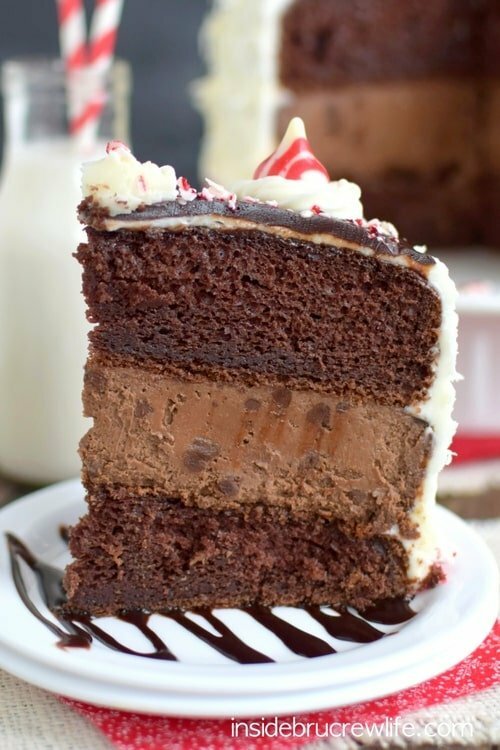 Okay…that middle layer is to DIE for!! Dying. I’m dead. This is gorgeous!! Oh my goodness, this cake is incredible! That is one glorious looking cake, Jocelyn! I’m completely in awe at your talent. Pinning! 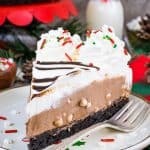 Now this looks like the most perfect holiday cheesecake! 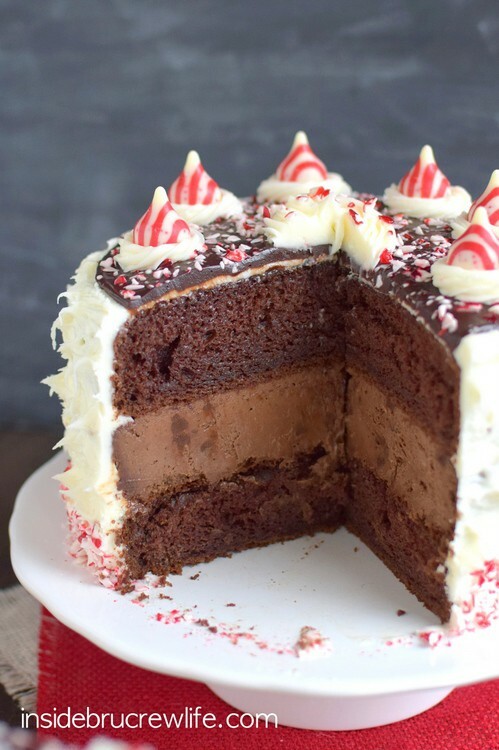 I love that you made a candy cane cake with chocolate. Such a brilliant idea! Pinned! Holy moly you are now dubbed the queen of all Christmas cakes! This is a masterpiece! This is such a gorgeous cake Jocelyn!! I’m in love with the peppermint and chocolate! This cake is completely gorgeous!! Could be the centerpiece for any holiday meal! Beautiful! I don’t comment a lot, but I had to say what a gorgeous cake this is! I bet it was delicious too. Thank you so much for the sweet comment, Kim!! 🙂 It tasted just as good as it looks! 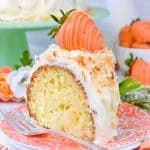 This is absolutely amazing, and I don’t know how would get an entire slice down but somehow I would have to manage. 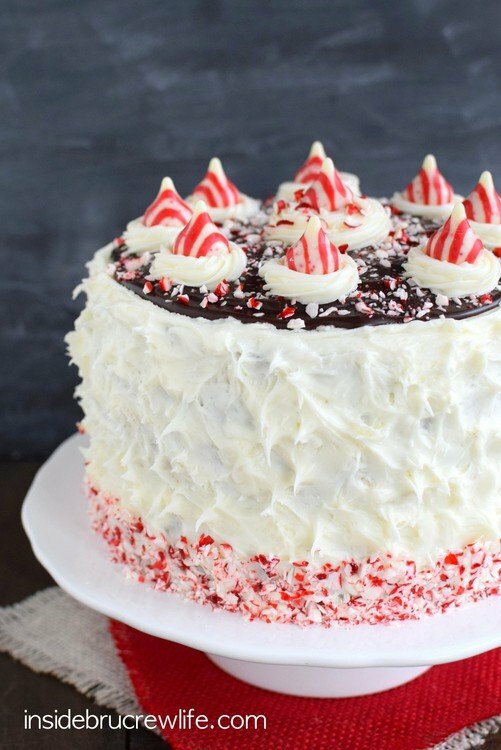 This cake is so pretty and festive! What an absolutely STUNNING cake! 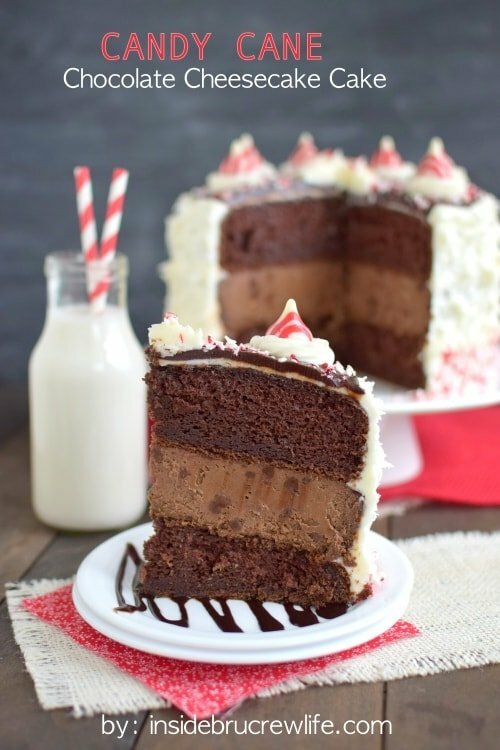 I love all things chocolate/peppermint and this cake is calling my name! Your parfaits look beautiful also…..how do you get the layers in the glasses without messing up the glass inside ? Well now that I’ve wiped up the drool from my keyboard I can tell you how incredible this cheesecake cake looks! 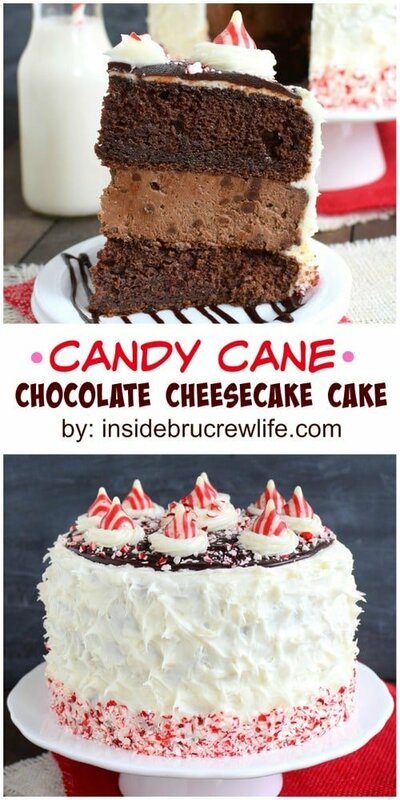 I’ve always wanted to try the cheesecake cake combo and this candy cane version looks perfect for Christmas! Oh my gosh, this beast of a cake is AMAZING. Wow! That looks absolutely incredible! It sounds delicious and is beautiful. Thanks for the cheesecake tips… I’ve just accepted that mine will crack no matter what. Haha! But I’m going to try your methods next time! Now that’s what I like to hear!! 😉 I hope you love this as much as I did, Anna! My socks are officially knocked off! What a gorgeous cake for the holidays, Jocelyn! Oh my word this cake is gorgeous, Jocelyn! I could use a piece (or 3) right now… amazing! 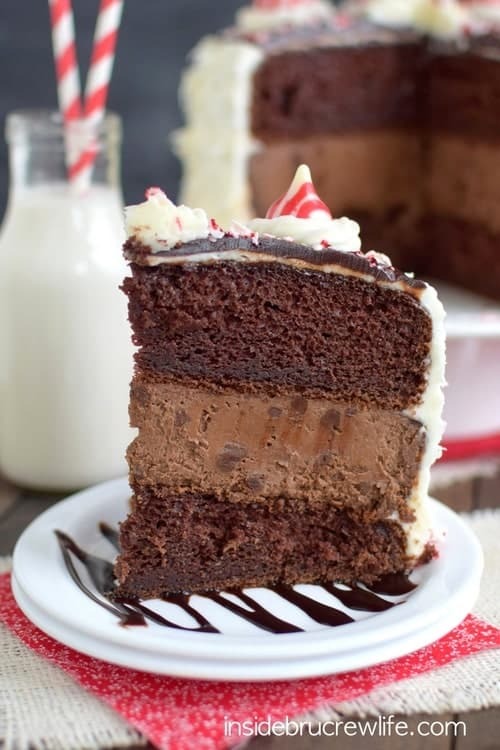 Such a great cake with all the chocolate and peppermint flavors, and cheesecake added for good measure. Amazing! From one baking horder to another, I also have everything to make this except the candy canes and candy cane kisses! My family would love this towering beauty! Ha, I love it! 🙂 I’m so glad I’m not the only baking horder out there!! Wow, I love how you decorated this cake! So chocolaty! It just feels good to make a nice, big layer cake sometimes. 🙂 Love the chocolate and peppermint! Oh my goodness!!! This cake is gorgeous, I love that you shared so many photos! Drooling over each and every one! Love chocolate and peppermint especially during this time of year! This is just stunning! Pinned! So many flavors here that I love! How can you go wrong with peppermint and chocolate?! Wowwwww, this is stunning!! And I am loving the combination of cake and cheesecake! Oh, how I love mint chocolate and Christmas! Jocelyn, these photos are gorgeous! What an incredible cake! I wasn’t exactly wearing any socks, but… This cake sure did knock my slippers off! I want what’s left of the cake after you cut out a slice for photographing. And I’m totally not sharing. 😉 Pinned! 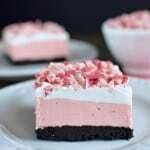 This recipe has all of my favorite things – peppermint, chocolate and cheesecake!